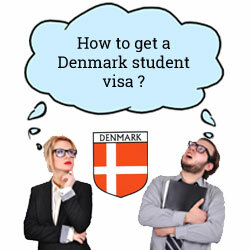 Home » Denmark » How to acquire Denmark student visa? This entry was posted in Denmark Denmark Immigration and tagged Danish student visa Denmark student visa Denmark study visa Denmark Visa student visa Study in Denmark on July 23, 2014 by Blog Author. Denmark is an appealing study destination for many foreign students now-a- days. Highly reputed educational institutions of the nation welcome students across the globe. Students outside the regions of EU/EEA or Nordic countries willing to study in Denmark have to acquire a Denmark student visa in the form of a residence permit. Study program in Denmark is categorized into three types namely higher educational program, Basic and youth study program and folk high school program. Students, who wish to acquire a Denmark student visa under any of the above three programs must meet a common requirement of supporting oneself financially throughout the stay in the country without seeking any public assistance or benefit payments. Besides, should be able to understand and speak the language of instruction with working knowledge of Danish, Swedish, English, Norwegian or German. Students applying under higher educational program for Denmark student visa may require to complete upper secondary school or the equivalent. An individual has to document that he or she has been admitted for higher educational program which is accepted by state authority or publicly recognized educational institution. Approval of the parent or guardian and guarantee that the place of study will help in providing proper conditions of study and residence in case the age of the student is within 18 years. Enrolment in a course at folk high school or similar that has gained the acceptance of the state authority. Head of the school has to state that the course pursued by the student is qualified for state subsidies or not. If the course is not qualified then the school has to attach a declaration regarding the course from publicly recognized educational institution. Should have paid required fees. Please fill out Our Enquiry form, for more Denmark information and also follow us on @ MoreVisas Facebook, LinkedIn, and Twitter. ← How to obtain Singapore Work Permit ?